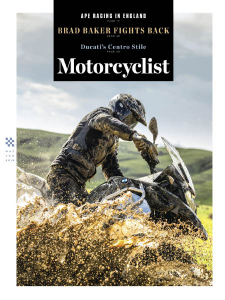 Motorcyclist USA - 05/06 2019 » Download PDF magazines - Magazines Commumity! For over 100 years, MOTORCYCLIST has been the rider's favorite magazine for in-depth reviews, reliable test data, rider insights and entertaining comparisons on the newest sportbikes, naked bikes, cruisers, touring bikes, adventure/dual-sports, supermotos, roadsters, and even scooters and minis. Breaking industry news, race reports, new product and gear tests, and how-to tech is brought to you by the most enthusiastic editorial staff of experienced riders, racers and builders who are into all things bike-related. You ride, we ride. We’re all in this together so let’s have some fun!